Thin-film solar panels are made with electricity-producing layers hundreds of times thinner than those in traditional silicon panels. These lightweight, durable solar modules can be made in several different ways, and with many unique materials. There are four major types of thin-film solar panels: amorphous, cadmium telluride (CdTe), copper gallium indium diselenide (CIGS), and organic solar panels. Like conventional solar panels, amorphous solar panels are made from silicon, but they are constructed in a different way. Instead of being constructed from solid silicon wafers like mono- or poly-crystalline solar panels, amorphous panels are made by depositing non-crystalline silicon on a substrate like glass, plastic, or metal. One layer of silicon on an amorphous solar panel can be as thin as 1 micrometer, which is much thinner than a human hair. 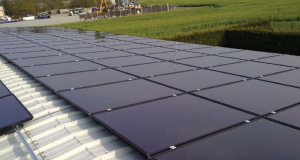 Unlike many other thin-film panel options, amorphous silicon panels use very little toxic materials. When compared mono- or poly-crystalline solar panels, amorphous panels use much less silicon. 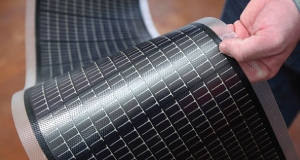 Amorphous solar panels are also bendable and less subject to cracks than traditional panels constructed from solid wafers of silicon. The ongoing challenge with amorphous solar panels is their low efficiency. Due to complicated thermodynamics and the degradation of amorphous silicon, among other factors, amorphous solar cells are less than half as efficient as mono- or poly-crystalline solar panels. Amorphous solar panels offer around a 7% efficiency rate, while mono- and poly-crystalline panels have efficiency ratings of anywhere from 14% to 20%+. Attempts to raise the efficiency of amorphous panels by stacking several layers, each in tune to different wavelengths of light, has proven somewhat effective, but the overall efficiency of these types of thin-film panels is low compared to other options. As the second most common photovoltaic technology on the market (behind traditional crystalline silicon), Cadmium telluride (CdTe) panels are already a viable thin-film solar panel solution. CdTe thin film panels are made from several thin layers: one main energy producing layer made from the compound cadmium telluride, and surrounding layers for electricity conduction and collection. First Solar is an American company that works in the cadmium telluride solar panel manufacturing space. One of the most exciting benefits of CdTe panels is their ability to absorb sunlight close to an ideal wavelength. Functionally, this means that CdTe solar panels can capture energy at shorter wavelengths than traditional silicon panels can, which matches the natural wavelengths of sunlight closely for optimal sunlight to electricity conversion. Additionally, cadmium telluride panels can be manufactured at low costs, as cadmium is abundant and generated as a byproduct of important industrial materials like zinc. A main concern with CdTe panels is pollution. Cadmium by itself is one of the most toxic materials known, and cadmium telluride also has some toxic properties. Currently, the general opinion on using cadmium telluride is that it is not harmful to humans or the environment in residential or industrial rooftop applications, but disposal of old CdTe panels continues to be a concern. Like amorphous panels, cadmium telluride panels don’t offer high efficiency ratings. Sitting around 10%-11%, CdTe panels are above the efficiencies of amorphous panels, but still don’t reach the average efficiencies of standard silicon panels. CIGS solar cells are made from a compound called copper gallium indium diselenide sandwiched between conductive layers. This material can be deposited on substrates such as glass, plastic, steel, and aluminum, and when deposited on a flexible backing, the layers are thin enough to be allow full-panel flexibility. Unlike most thin-film solar technologies, CIGS solar panels offer a potentially competitive efficiency to traditional silicon panels. With efficiencies exceeding 20% measured in the laboratory, there may be a continuing place for high-efficiency CIGS panels in the general solar panel market. CIGS cells also use the toxic chemical cadmium. However, CdTe panels have a higher percentage of cadmium, and CIGS cells are a relatively responsible thin-film option for the environment. Even better, in some models the cadmium is completely removed in favor of zinc. The primary disadvantage of CIGS panels are their price. While CIGS solar panels are an exciting option, they are currently very expensive to produce, to the point where they can’t compete with traditional silicon or cadmium telluride panels. Production costs continue to be an issue for the CIGS solar panel market. 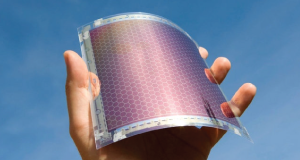 Organic photovoltaic (OPV) cells use conductive organic polymers or small organic molecules to produce electricity. In an organic photovoltaic cell, several layers of thin organic vapor or solution is deposited and held between two electrodes to carry an electrical current. The building-integrated photovoltaic (BIPV) market has the most to benefit from OPV cells. 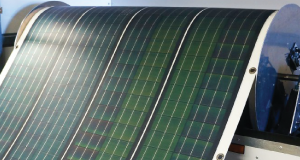 Due to the ability to use various absorbers in an organic cell, OPV devices can be colored several ways, or even made transparent, which has many applications in unique BIPV solar solutions. The materials needed to build organic solar cells are also abundant, leading to low manufacturing costs and subsequently low market prices. Like other thin-film options, organic photovoltaic cells currently operate at relatively low efficiencies. OPVs have been constructed with about 11% efficiency ratings, but scaling module production up while keeping efficiencies high is a problem for the technology. Much of the research currently surrounding OPVs is on how to boost their efficiency. An additional issue with OPV technology is a shorter lifespan than both other thin-film options and traditional mono-or poly-crystalline panels. Cell degradation that doesn’t occur in inorganic modules is an ongoing struggle for organically-based photovoltaic products.